Ground beef is as versatile as it is tasty, and can be combined with other ingredients to make some of the best recipes in your repertoire. From pasta sauce to traditional Indian fare, the following top-notch recipes will give you great taste with simple ingredients to rival even the world's best hamburger recipe. This prize-winning taco burger recipe took third place at the 2010 National Hamburger Festival Amateur Cooking Contest. The addition of taco seasoning and tequila take this burger out of the realm of the ordinary and into the realm of the extraordinary, and the mango-avocado salsa is the perfect topper. TV chef Alton Brown created the recipe for these deceptively simple burgers. The key is the quality meat you grind yourself in a food processor just before forming the patties for a fresh, rich flavor. Better Homes and Gardens featured this pasta with Bolognese sauce, claiming the ground beef-based sauce is the best ever created. The sauce is packed with vegetables and seasonings as well as ground beef. It cooks up in just 20 minutes, so it's as fast as it is delicious. 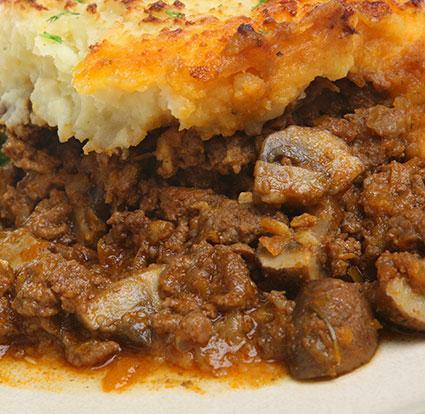 If you like casseroles, consider giving this recipe for ground beef pie created by Symon's Supper's chef Michael Symon. The dish is reminiscent of shepherd's pie, but bakes up in a cast-iron skillet for a rich crust and flavor. Country Living has this meatloaf recipe listed under some of the best they've ever featured, and it combines ground beef with ground pork and veal. This meatloaf will call to mind the family recipe your grandmother used to make, complete with a zesty ketchup-based topping. Chef Jamie Deen, of Home for Dinner with Jamie Deen, has created this recipe for award winning chili. It uses Italian sausage along with ground beef and three kinds of beans for a rich flavor. Woman's Day magazine features Balsamic Meat Loaf as one of their best recipes for ground beef. Balsamic vinegar turns ordinary meatloaf into a gourmet creation sure to please everyone. The garlicky side dish is the perfect accompaniment. Rachel Ray featured these award winning hamburgers on her site. The recipe comes from Katie Lee Joel, who used it to win the New York Wine and Food Festival Burger Bash. The burgers are toasted on bread, rather than a bun, for a ground beef sandwich. Aarti Sequeira of Aarti's Party created this recipe of Indian ground beef with peas. The dish is deceptively simple, but full of rich flavor and texture. Traditional Indian flavors such as garam masala and cumin are featured. Chef Ronaldo from the BBC show Chef Race has created this winning recipe for picadillo. Ronaldo describes it as a Cuban Sloppy Joe, with a lot more heat and flavor thanks to Spanish olives, raisins, smoked paprika, and several other flavorful additions.